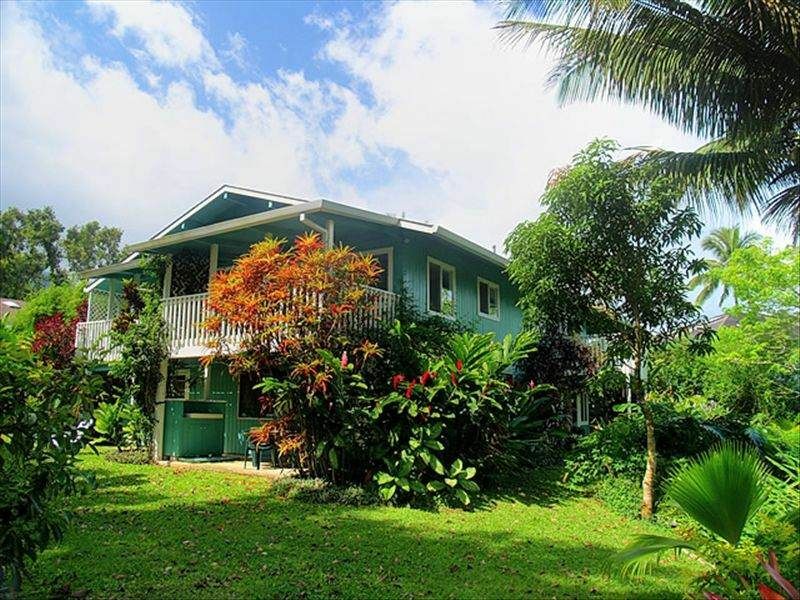 Maluhia Hanalei is a beautiful Hawaiian-style home just one block from the magnificent two-mile crescent beach at world-renowned Hanalei Bay. The furnishings, amenities, and setting make it a wonderful vacation home from which to enjoy the wonders of Kauai's North Shore. A two-minute walk from the house is magnificent Hanalei Bay and its famous, white-sand beach. A short stroll will bring you to quaint, historic, downtown Hanalei, with its wonderful array of restaurants, shops, and galleries. Within a ten-minute drive you will find numerous beautiful beaches and a huge variety of activities to keep you busy. The house is at the end of a cul-de-sac, set back off the road, and down a long driveway on a wonderfully-landscaped quarter acre adjacent to a conservation area. The setting is lush, green, private, quiet, very secluded, and yet only a block to the beach and a five-minute walk into town. An ideal location. Maluhia Hanalei is a single-family home which will accommodate up to 10 guests. Groups of up to 6 can rent the spacious three- bedroom, two bath upstairs main part of the house separately. See the notes below the chart on the rates page for rates. There is also a lovely garden level apartment with two more bedrooms, living room, full kitchen, and full bath for up to an additional 4 guests. This can be rented separately or with the rest of the house. See VRBO 507143 for the separate apartment listing. The house is beautifully decorated and fully equipped. Larger groups will find that the whole house combines to make an ideal vacation home for up to 10. The individual suites give the smaller groups within the large one their own separate spaces and the upstairs has a very open, spacious floor plan with plenty of room for everyone to gather for meals and visiting. Guests will enjoy the wonderful outdoor shower, the myriad birds in the trees, the wonderful sunrises and sunsets, the lush foliage and flowers everywhere, and the lovely tropical views from the extensive lanais and patios. The Hibiscus, 3BR, 2BA main house and the Plumeria 2BR garden suite can each be rented separately. See the Notes section on the rates page for more information. See our You Tube video, Maluhia Hanalei, for great views of the house and its surroundings. TVRNC Permit #1020 On Island Contact Karen LaMore Please do not contact for reservations. Like so many other visitors, I was entranced by the sheer beauty of the north shore of Kauai. It gives me so much pleasure to be able to share this paradise with others by opening my home to visitors from all over, so they too may experience the rare unspoiled nature of one of the most special places on earth. My travels have taken me all over the world, but Kauai always drew me back. Hanalei and the north shore of Kauai will never change, never be developed, never have hotels, condos, or very much tourist infrastructure. This most beautiful spot is protected and secure in it's beauty and appeal. What better spot to have a home to come to and to share with others. My home is not only beautiful, charming, comfortable and inviting, but also very private and secluded, surrounded by beautiful gardens, and adjacent to a tropical hardwood forest. The foliage, the flowers, the birds, the sunrise, the relaxation of this wonderful environment, combined with the beach at Hanalei Bay and Hanalei town both being a very short walk from the house make it the ideal spot for the ultimate getaway. The ocean is just a block away at Hanalei Pavilion Park. a surfer's paradise in the winter, calm waters in the summer, smooth sandy beach, gorgeous scenery. (2) There are two dryers on the property, one upstairs and one downstairs. Beautiful gardens with bananas, papayas, avocados and limes in additional to many flowering plants.